Showing results for "2 way radios"
These 2-Way radio Walkie Talkies are ideal for a whole host of things, from stopping friends and family getting lost to keeping the kids entertained. Operating Frequency - 446.00625- 446.04375 (MHz). Set includes 2 radios. 8 channels with up to 2km range. 81 hours battery life. Volume control. Auto channel scan. Battery level indicator. Batteries required: 3 x AAA (not included). 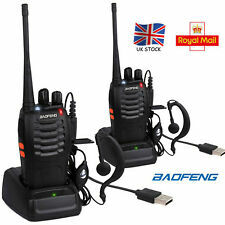 High- specification two-way radios; Lightweight; Simple operation; Splash-proof (IPx2 rated); Hands-free operation; Integrated LED torch; Vibrate alert; Room monitor; Scan function; Accessory connector; Illuminated LCD; Rigorous Motorola 5-year life testing; Twin-pack includes 2 radios, Rechargeable batteries, Belt clips, Charging pod. Set includes 2 radios. 968 channels with up to 10km range. 16 hours battery life. Volume control. Voice activation. Auto channel scan. Vibration alert. Battery level indicator. Charging pods included. Backlit display. Keypad lock. Headset port. Batteries required: 2 x rechargeable (included). Argos.co.uk Motorola XT460 2 Way Radio - No Charger. Ultimate durability radios for tough conditions; Metal chassis; Weatherproof (IP55 rated); Meets Military standards; Voice announcements; Illuminated LCD, Voice scramble; Channel alias; Programmable via computer software; Privacy codes; Tested to simulate 5-years usage; Pack includes single radio, LiIon battery and swivel belt holster. Set includes 1 radio. 1752 channels with up to 10km range. 20 hours battery life. Volume control. Voice activation. Auto channel scan. Battery level indicator. Backlit display. Keypad lock. Headset port. Batteries required: 1 x Li-Ion (included). Argos.co.uk Motorola XT420 2 Way Radio with Single Charger. Ultimate durability radios for businesses and tough conditions; Metal chassis; Weatherproof (IP55 rated); Meets Military standards; Voice announcements; Channel alias; Programmable via computer software; Privacy codes; Accelerated life testing simulating 5-years usage; Pack includes single radio, LiIon battery and swivel belt holster. Set includes 1 radio. 1752 channels with up to 10km range. 20 hours battery life. Volume control. Voice activation. Auto channel scan. Battery level indicator. Charging pods included. Keypad lock. Headset port. Batteries required: 1 x Li-Ion (included). Fully featured, tough and stylish, the TLKR T60 walkie talkie is the ideal way to stay connected during outdoor adventures. At home on the campsite, theme park or hike, packed with functionality, including a range of up to 8km, multiple call tones and rechargeable batteries. PMR446 radios, license free, free calls, rechargeable NiMH batteries (supplied), 8 Channels + 121 codes and scan/monitor. . Set includes 2 radios. 8 channels with up to 8km range. 16 hours battery life. Volume control. Battery level indicator. Charging pods included. Backlit display. Headset port. Batteries required: 4 x AA (included). These Binatone Terrain 350 2-Way Radio Walkie Talkies are great for keeping the kids entertained or co-ordinating trips out. Features: - Long Range of up to 8km - Auto Channel Scan - FM Radio - IPX2 Rated - Backlit Display - Rechargeable Battery Pack. Set includes 2 radios. 968 channels with up to 8km range. 50 hours battery life. Volume control. Auto channel scan. Battery level indicator. Charging pods included. Backlit display. Keypad lock. Headset port. Rechargeable (included). Manufacturers 2 Year (1 year fabric) guarantee. Argos.co.uk Motorola XT180 2 Way Radios - Twin. 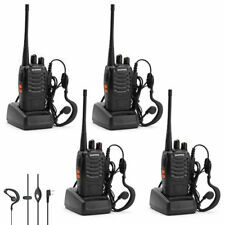 General purpose radio, ideal for businesses; Lightweight; Splash-proof (IPx2 rated); Headsets included for private communications and hands-free operation; Integrated torch; Vibrate alert; Room monitor; Scan function; Rigorous Motorola 5-year life testing; Twin-pack includes 2 radios, Rechargeable batteries, Belt clips, Charging pod. Set includes 2 radios. 968 channels with up to 8km range. 14 hours battery life. Volume control. Voice activation. Auto channel scan. Vibration alert. Battery level indicator. Charging pods included. Backlit display. Keypad lock. Headset port. Batteries required: 2 x rechargeable (included). The Motorola Talker T40 2-way radio/walkie- talkies are simple, compact and easy to use by all the family for quick and easy communication. Whether around the shops, on the beach or in the garden, these radios are the perfect way of staying in touch when out and about. License free, 8 PMR channels with monitor, LCD display, up to 4km range, keypad tones & talk tone confirmation/roge r beep. Set includes 2 radios. 8 channels with up to 4km range. 16 hours battery life. Volume control. Battery level indicator. Backlit display. Keypad lock. Batteries required: 3 x AAA (not included). These Binatone Terrain 350 2-Way Radio Walkie Talkies are great for keeping the kids entertained or co-ordinating trips out. Features: - Long Range of up to 5km - Auto Channel Scan - Rechargeable Battery Pack. Set includes 2 radios. 8 channels with up to 5km range. 81 hours battery life. Volume control. Auto channel scan. Battery level indicator. Backlit display. Keypad lock. Headset port. Batteries required: 3 x rechargeable (included). Manufacturers 2 Year (1 year fabric) guarantee. Argos.co.uk Motorola XT420 2 Way Radio - No Charger. Ultimate durability radios for businesses and tough conditions; Metal chassis; Weatherproof (IP55 rated); Meets Military standards; Voice announcements; Channel alias; Programmable via computer software; Privacy codes; Accelerated life testing simulating 5-years usage; Pack includes single radio, LiIon battery and swivel belt holster. Set includes 1 radio. 1752 channels with up to 10km range. 20 hours battery life. Volume control. Voice activation. Auto channel scan. Battery level indicator. Keypad lock. Headset port. Batteries required: 1 x Li-Ion (included). Argos.co.uk Motorola XT460 2 Way Radio with Single Charger. Ultimate durability radios for tough conditions; Metal chassis; Weatherproof (IP55 rated); Meets Military standards; Voice announcements; Illuminated LCD, Voice scramble; Channel alias; Programmable via computer software; Privacy codes; Tested to simulate 5-years usage; Pack includes single radio, LiIon battery and swivel belt holster. Set includes 1 radio. 1752 channels with up to 10km range. 20 hours battery life. Volume control. Voice activation. Auto channel scan. Battery level indicator. Charging pods included. Backlit display. Keypad lock. Headset port. Batteries required: 1 x Li-Ion (included). Take favourite music anywhere with this portable AM/FM Bluetooth radio, featuring USB port and SD card slot Size: Medium. Colour: White And Pink. Gender: Unisex. Age Group: Adult. Featuring two focus modes and exterior coated in green rubber this telescope can be an ideal companion on a sightseeing trip Size: Large. Colour: Green. Gender: Unisex. Age Group: Adult. Sing along to favourite songs in the shower with Intempo shower radio, which has dual-band capability and a convenient suction fixing Size: Large. Colour: Pink. Gender: Unisex. Age Group: Adult. Sing along to favourite songs in the shower with Intempo shower radio, which has dual-band capability and a convenient suction fixing Size: Large. Colour: Green. Gender: Unisex. Age Group: Adult. Take favourite music anywhere with this portable AM/FM Bluetooth radio, featuring USB port and SD card slot Size: Medium. Colour: Black And White. Gender: Unisex. Age Group: Adult. Take favourite music anywhere with this portable AM/FM Bluetooth radio, featuring USB port and SD card slot Size: Medium. Colour: Black. Gender: Unisex. Age Group: Adult. Take favourite music anywhere with this portable AM/FM Bluetooth radio, featuring USB port and SD card slot Size: Medium. Colour: Black And Blue. Gender: Unisex. Age Group: Adult. Argos.co.uk Roberts Radio Dreamdock 2 Digital Clock Radio - Black. Dreamdock 2 is a Digital clock radio which has DAB/DAB+ Wavebands. Play your music from your iPhone or iPod with the built in lightning dock. Stereo sound, a remote control and dual alarms means this is one of the best clock radios on the market. Stereo sound and remote control. Product features: Generates 2 watts RMS. RDS scrolling text for digital radio. Alarm with sleep timer function. Auto time update. Auto tune and auto scan. Auxiliary input connector for iPod or MP3. Bass and treble controls to change audio levels. General information: Size H9, W17, D13.3cm. AA (not included).